It’s hard to imagine that someone would get bored limiting their diving experiences to coral reefs, but for those looking for a little variety in their underwater adventures, why not try exploring some of the world’s best places to dive that have absolutely nothing to do with animals that could populate a Disney movie? 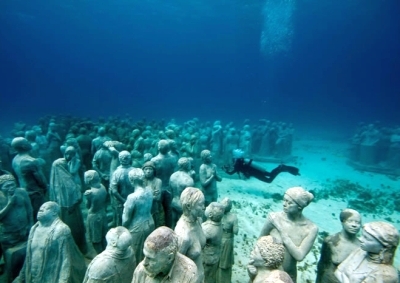 For example, in the Caribbean waters off of Cancun, Mexico, is the Underwater Museum of Modern Art, a creation of artist Jason deCaires Taylor who planted over 400 life-sized coral-friendly sculptures on the seabed, offering divers a once-in-a-lifetime museum-going experience. Or if X-Files-like encounters are more your thing, near the Yaeyama Islands off the westernmost point of Japan is an underwater pyramid whose origin has yet to be explained. Natural phenomena, aliens, ancient Egyptians way off course — no one knows for sure, but scientists are at least sure the structure dates back some 5,000 – 8,000 years. For the rest of the list, check out the full article at CNN.com.